The Graphs and Models series by Bittinger, Beecher, Ellenbogen, and Penna is known for helping students “see the math” through its focus on visualization and technology. These texts continue to maintain the features that have helped students succeed for years: focus on functions, visual emphasis, side-by-side algebraic and graphical solutions, and real-data applications. With the Sixth Edition, visualization is taken to a new level with technology, and students find even more ongoing review. 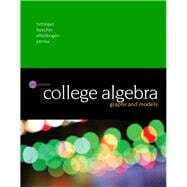 MyMathLab® is an online homework, tutorial, and assessment program designed to work with this text to engage students and improve results. Within its structured environment, students practice what they learn, test their understanding, and pursue a personalized study plan that helps them absorb course material and understand difficult concepts. New Guided Visualizations in MyMathLab help students allow for hands-on manipulation to gain understanding of difficult concepts. References to 28 Just-In-Time review topics are placed throughout the text and MyMathLab to help students right when they need it most, and new Cumulative Review Assignments and Skill Maintenance Quizzes are pre-made and assignable in MyMathLab to help students connect concepts and maintain skills throughout the course. Plus, new Video Assessment Exercises and a new Video Notebook further enhance the MyMathLab course and resources available. Marvin Bittinger has been teaching math at the university level for more than thirty-eight years. Since 1968, he has been employed at Indiana University—Purdue University Indianapolis, and is now professor emeritus of mathematics education. Professor Bittinger has authored over 190 publications on topics ranging from basic mathematics to algebra and trigonometry to applied calculus. He received his BA in mathematics from Manchester College and his PhD in mathematics education from Purdue University. Special honors include Distinguished Visiting Professor at the United States Air Force Academy and his election to the Manchester College Board of Trustees from 1992 to 1999. His hobbies include hiking in Utah, baseball, golf, and bowling. Professor Bittinger has also had the privilege of speaking at many mathematics conventions, most recently giving a lecture entitled "Baseball and Mathematics." In addition, he also has an interest in philosophy and theology, in particular, apologetics. Professor Bittinger currently lives in Carmel, Indiana, with his wife, Elaine. He has two grown and married sons, Lowell and Chris, and four granddaughters. David Ellenbogen has taught math at the college level for twenty-two years, spending most of that time in the Massachusetts and Vermont community college systems, where he has served on both curriculum and developmental math committees. He has also taught at St. Michael's College and The University of Vermont. Professor Ellenbogen has been active in the American Mathematical Association of Two Year Colleges since 1985, having served on its Developmental Mathematics Committee and as a delegate, and has been a member of the Mathematical Association of America since 1979. He has authored dozens of publications on topics ranging from prealgebra to calculus and has delivered lectures at numerous conferences on the use of language in mathematics. Professor Ellenbogen received his BA in mathematics from Bates College and his MA in community college mathematics education from The University of Massachusetts at Amherst. A co-founder of the Colchester Vermont Recycling Program, Professor Ellenbogen has a deep love for the environment and the outdoors, especially in his home state of Vermont. In his spare time, he enjoys playing keyboard in the band Soularium, volunteering as a community mentor, hiking, biking, and skiing. He has two sons, Monroe and Zack. Judy Penna received her undergraduate degree in mathematics from Kansas State University and her graduate degree in mathematics from the University of Illinois. Since then, she has taught at Indiana University—Purdue University Indianapolis and at Butler University, and continues to focus on writing quality textbooks for undergraduate mathematics students. In her free time she likes to travel, read, knit, and spend time with her children.